Best Canvas For Painting For Beginners: Stretching Out Your Skills! So you’ve got all your your supplies, your paints, brushes what have you, now what are you going to paint on exactly? Why a canvas of course!! Back in the old days a lot of artists stretched their own – to be honest, some modern day artists do too Some work is involved, that. But we are a long way this side of working smarter and not harder, and most of us purchase the kind of canvas that is already stretched and ready to go. If you’re just starting out, all that legwork I described above is a skill for another time. Let’s get to the meat and potatoes of choosing the best canvas for painting-whether you’re taking classes or exploring a new hobby. What Should You Look For in an Art Canvas? A quality artist canvas will be stretched, primed, read “cotton duck” on the label-that’s the gist of it, mainly. Bob Ross used to say on his show The Joy of Painting that a good canvas is “tough as nails” One thing I have noticed lately is that canvases are a little more lightweight than they used to be. That said always look to be sure that: 1) the frame is sturdy and not warped, 2) no loose staples are showing 3) clean surface with no evidence of yellowing, and finally 4) a smooth surface with a slight “tooth” to it. So Who Makes the Best Canvas For Painting? 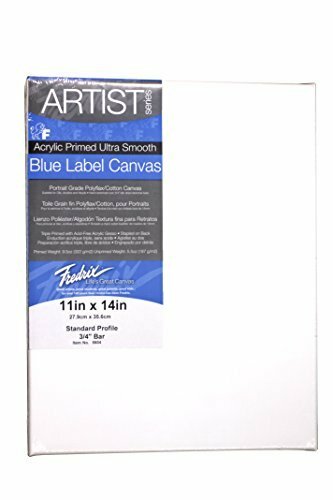 What Size Canvas Is Best for Painting? OK guys…I promised you the straight dope and here it is. Get Fredrix!! They are truly the best brand and I have been painting on them since, well, Bill Clinton’s first term in office. Have I used other brands? Sure…but I can tell you that Fredrix is the best. 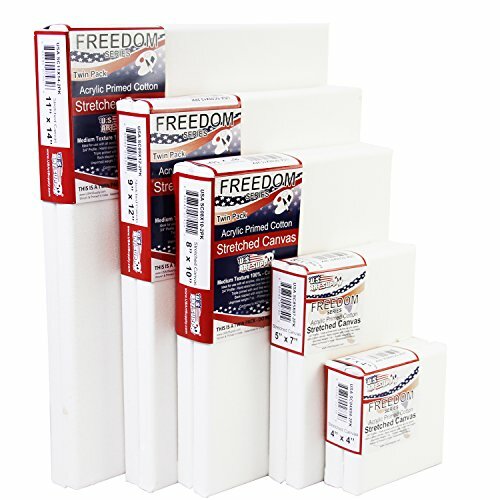 They have been around a long long time, and not only will you get a quality canvas to work on, you have lots of different styles and sizes to choose from. After all, these guys go back to like, the 18th century, what’s not to like? Just look for the lion in the corner! I’ll try to cover as much ground with the various options and what’s best for you in the next sections shortly. When I first started out there was only that one red label variety, the classic medium texture and now there is a “smooth texture” with a blue outer wrap. Both are excellent. 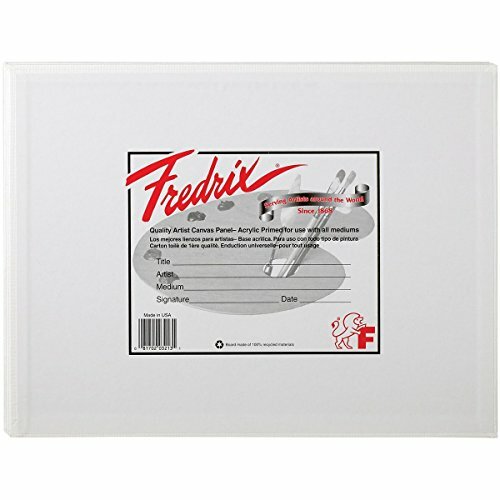 In recent years they came out with staple-free edge canvases. They are, rest assured, very secure – they are bound together differently. I have never had cause for concern. The bottom one shown in the picture here is one of these , as you can see the staples are applied to the back instead. 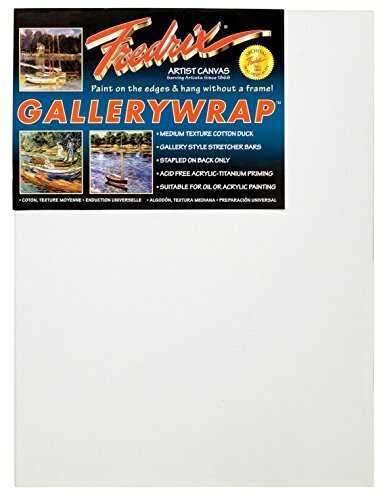 If you are looking for a strong canvas that will stand the test of time look no further than the “gallery wrapped” artist canvas. I think they got their name due to the fact that they were designed with the intent of frameless displaying without compromising on appearance. They’re very sturdy, the extra thickness making the chances of getting out of shape much slimmer. In addition, because you don’t need to frame them; they weigh much less and you can get to the fun part of hanging your finished canvas wall art soon after! As such, they do cost a little more – but totally worth it, as not only do you not need to deal with framing/wires/hangers, etc. (well, perhaps the latter) you can also paint the perimeter, too, or just let your prospective art design bleed onto it (a very popular technique) or paint it a different color altogether. A gallery wrapped artist canvas is 1 and 1/2″ thick while the status quo standard thickness is about 3/4″. 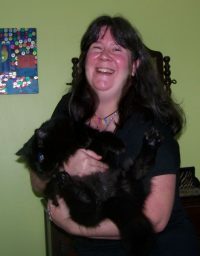 ♥ Two, they have a tendency to warp – more so with the larger sizes. However, I have had a few 11 by 14s to do this on occasion. Panels are sold in bundles, usually like 2-3 in a pack. I got them every now and then, and always stuck to 14″ or smaller. Canvas sheets are the minimalist version of their stretched counterpart. They are usually sold like a “sketch pad” in which X number of sheets are bound together and you just tear out one at a time. I ended up making a special frame for a painting I did on one of these later. I did buy one of these once and although they took paint well you definitely need some kind of special clipboard kind of workspace to clamp them in place…I don’t feel like they are newbie-friendly at all, just my 2 cents worth. Sometimes you can get Fredrix canvases in unique designs and shapes. One unique style I have seen is the Convexo. Basically the border edge has a convex design which makes the canvas have a built-in framed appearance naturally. 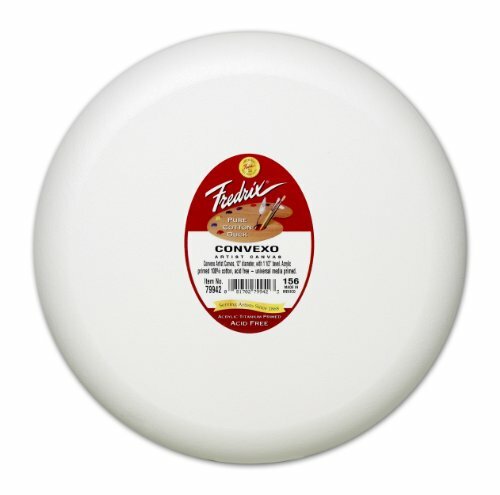 The Convexo style is available in ovals as well as the standard rectangle/square shape. Sometimes you can get canvases in round or oval shapes. I have only one oval…Personally I don’t care for elliptical sizes as they limit my ideas a little. but that’s just me 🙂 The quality is still good and also has the Convexo option too. I’d recommend you start with a smaller size in the neighborhood of 20″ in length or smaller. My favorite sizes have always been 11 by 14, 16 by 20 and 14 by 18. If you like the big sizes (say, 30″ by 40″) best, it is best to choose the gallery wrap as the quality will be much better long-term and they will be less likely to warp. You may find that sometimes there is a cross piece in the middle of big canvases to support them better, but the gallery wrap is still made sturdier! 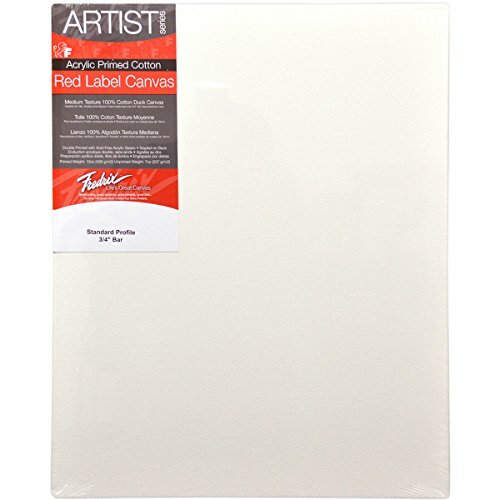 Tip: With every artist canvas is a set of four plastic triangle-shaped thingys and you may wonder what they are for…they slide into the frame corners and add a little extra stability. Don’t worry, their use is strictly optional. For the larger sizes it is best to choose that 1 1/2″ thick “gallery” style as the price will be well worth it, as well as perfect for newbies and pros alike.